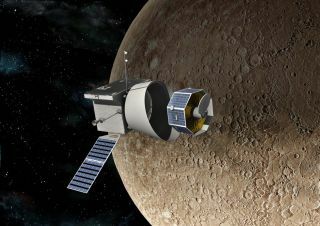 Artist's impression of the BepiColombo mission at Mercury. BepiColombo is a planned European-Japanese mission to Mercury. It successfully launched on Oct. 19, 2018. The mission includes a carrier spacecraft called the Mercury Transfer Module (MTM) – which supplies electrical power during interplanetary cruise – and two separate orbiters. The European Space Agency's spacecraft is the Mercury Planet Orbiter (MPO) and the Japanese Aerospace Exploration Agency's spacecraft is the Mercury Magnetospheric Orbiter (MMO). Japan's MMO will be dormant during the interplanetary cruise, with occasional startups to make sure that the spacecraft is operating properly. Europe's MPO will communicate with Earth and also command the Japanese spacecraft and the MTM until the three components are separated. The MTM will separate from the orbiters just before Mercury orbit is achieved. Then, the two spacecraft will each be put in separate orbits to perform scientific investigations of Mercury. Japan's MMO will have an orbit of 9.3 hours, and Europe's MPO an orbit of about 2.3 hours. The mission is expected to last for one Earth year, which is the equivalent of four Mercury years. It may be extended for an additional Earth year if funding allows, and the two spacecraft remain in good health. The first European proposal for a Mercury mission came in 1993, according to the European Space Agency (ESA). The agency included a Mercury orbiter as one of three possible new "cornerstone" missions as a part of the Horizon 2000 science program, which also birthed the Cassini orbiter that visited Saturn and its moons, as well as the accompanying Huygens lander for Titan. BepiColombo and another mission called Gaia, to create a three-dimensional map of the Milky Way, were approved in 2000. ESA then issued a request for proposal for the BepiColombo MPO payload in 2004. The payload is the part of the spacecraft that performs the main functions of the mission, including scientific investigations. The payload instruments were selected later that year. The launch date has been pushed back several times. A target of July 2014 was delayed to August 2015 after Astrium looked at the development of several components of the spacecraft (such as the solar arrays and the electric propulsion system) and determined they couldn't make the earlier deadline. Subsequent delays in different parts of the mission development pushed the launch date back to 2016, 2017 and then 2018. BepiColombo's April 2018 launch date was then delayed six months to October 2018 after a major electrical problem was found during a test of MTM. When the announcement was made in late 2016, ESA said it forecasted no impact to the science return of the mission. In the early days of the space age, scientists were trying to figure out the most efficient way to take pictures of Mercury. Although the planet sometimes closes in to within 48 million miles (77 million kilometers) from Earth – roughly a third of the Earth-Mars distance – it takes an extraordinary amount of energy to brake a spacecraft to go into Mercury's orbit, ESA said. Studies from the 1950s and 1960s suggested that a spacecraft could use Venus' gravity to slingshot to Mercury, thus getting to the planet without needing to use much rocket fuel. Opportunities to take advantage of this slingshot would come up in 1970 and 1973, according to early 1960s research from Michael Minovich, a University of California at Los Angeles graduate student. This is where BepiColombo's namesake comes in. Giuseppe "Bepi" Colombo was then a celestial mechanics researcher at Padua University in Italy. He showed that after a spacecraft made one flyby past Mercury, it would go into a 176-day orbit around the sun. Luckily, this is exactly double the 88-day Mercury year, making it easy for the spacecraft to return to Mercury repeatedly with just minor orbital modifications. "The only drawback was that the surface lighting conditions would be the same for each encounter," ESA wrote. This was the plan that the first Mercury mission followed. Called Mariner 10, the NASA mission launched on Nov. 3, 1973. In February, the mission swung by Venus and safely made it to its first closest approach to Mercury on March 29, 1974. Although the spacecraft approached on the night side, images were sent back showing the sunlit hemisphere as the spacecraft pulled away. "The surface was seen to be subdivided into intercrater plains, smooth plains, and heavily cratered terrain that resembled the landscapes on Earth's moon. The most notable individual feature, partially visible on the sunrise terminator, was a giant impact basin that was named Caloris," ESA wrote. "Other surprising features were steep cliffs, hundreds of kilometers in length, that appeared to have been formed by global compression, possibly due to shrinkage of the planet as it cooled." Mariner 10 remained the only spacecraft to visit Mercury for a generation, until the MESSENGER (MErcury Surface, Space ENvironment, GEochemistry, and Ranging) mission was launched on Aug. 3, 2004. It got to Mercury after repeated gravity assists from Mercury, Venus and Earth. The spacecraft performed three flybys in January 2008, October 2008 and September 2009 before orbiting Mercury between March 2011 and April 2015, when it ran out of gas and crashed into the planet. Some of MESSENGER's major discoveries include evidence of water ice in permanently shadowed craters at the planet's poles, depressions called "hollows" that are only known to exist on Mercury, and extensive volcanic activity across the planet.